Above: Inside Abe&apos;s Fly Shop. Photograph Courtesy Abes&apos;s Fly Shop. For six decades, Abe’s Fly Shop and Motel has helped feed, lodge, and outfit folks who come to this part of northwestern New Mexico to fish the gentle stretch of the San Juan River below Navajo Dam, or to drop a line into the vast lake above it. Since 1958, Abe’s has served as a rest stop, stomach-fueling station, outfitter—and Fish Tale Central. 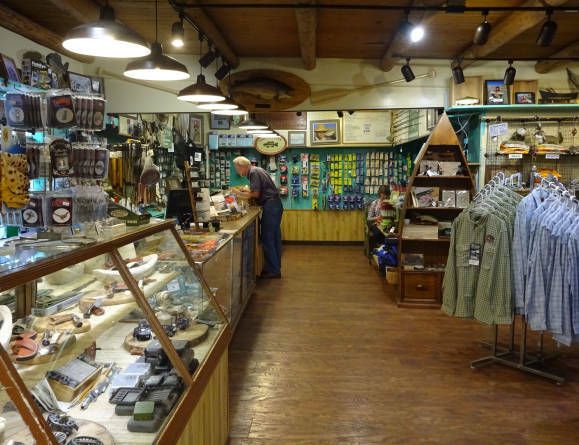 Founders Abe and Patsy Chavez have mostly passed the torch to the next two generations, but the shop remains a beloved hub for anglers. Abe Chavez began fishing the San Juan River as an adventurous eight-year-old who waded into the warm trickle of water and snapped up pan fish for his lunch. That was long before a 400-foot-tall dam created Navajo Lake and changed the river forever. How could they have known how much the finished lake would change fishing on the river? How the release of cold, nutrient-rich water from the bottom of the dam would create the precise, constant water temperature that spurred the newly stocked rainbow trout to spawn several times a year? They couldn’t have predicted exactly how that water would cause changes in plant and insect life, producing bigger, fatter trout than ever before and creating one of the top fly-fishing destinations in the country. But they definitely knew to capitalize on those changes, stocking everything an enthusiast could need, adding rooms to the motel, and expanding the shop’s offerings to serve lake fishermen, too. In the 1980s, their son Tim and his wife, Andrea, introduced a river guide service. Today they help thousands of trout stalkers experience the year-round bounty of the river, floating and wading into the five miles of quality water above the shop. This August, three genera-tions of the Chavez family celebrate Abe and Patsy with a month of sales, special events, and, of course, 60 years of fish tales (1791 NM 173, Navajo Dam, 505-632-2194, sanjuanriver.com).